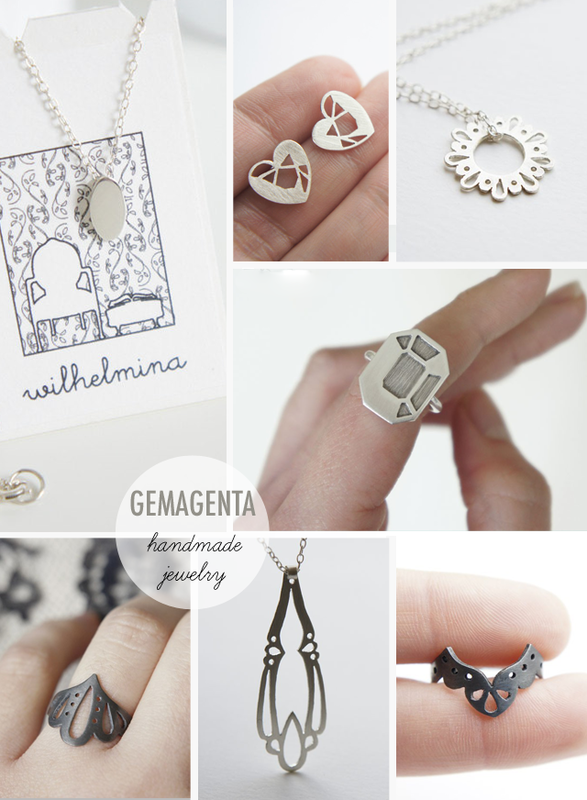 Gemagenta is the shop where the most delicate, feminine and playful jewelry lives. I own this ring, cherish it, and can almost not take it off my finger! Lorena, the lovely person behind Gemagenta is a mexican industrial designer and jeweler, who handcrafts every single piece of jewelry in her Amsterdam studio. She called her shop Gemagenta as a mix of her two greatest passions, creating jewelry and illustrating : “gem” for jewels, and “magenta” for the illustration printing ink in CMYK. For me a Jewel is so much more than a fashion accessory or an embellisher, it’s a small piece of art that tells a story about itself, about its creator and about its wearer. It thrills me to think that through my jewels I can be part of other people's lives and reach places I have only imagined. This giveaway is now closed. Winner has been announced. Thank you so much for playing along! Visit Gemagenta, come back here and leave a comment letting us know which item is your favorite. Please note : You are free to use as many (up to 5) or as few different ways of entering as you want. If you use more than one way to enter, please leave a separate comment for each entry. If you win, we will need to contact you, so please make sure to leave your email address or any way to be contacted. This giveaway is open to all (worldwide).Giveaway ends on Sunday, November 6 2011 at 11:59pm EST time, and the winner will be randomly chosen using a random number generator. P.S. : The winner of Ink Illusion Giveaway is Robin (#73) ! Congrats Robin, and thanks so much to all who entered! I love the ring you got! so jealous! I am a gemagenta fb follower, my favorite is the lingerie elongated pennant! Lingerie 002 in sterling silver ring is so delicate pretty and feminine! love that look. Oh! I love the pendeloque earrings. So pretty! I love the Faceted Trillion (Triangle) Pendant! Loving the Josephine - Miniature Mirror Pendant. The perfect little something! I love the lingerie mini studs in satin! I've been wanting a new pair of earrings for a while and these look perfect! I'm already a follower of your lovely blog! I love the Lingerie Sweetheart Neckline Pendant . I "Like" Gemagenta on Facebook. my favorite piece is the lingerie sweetheart neckline pendant. I like gemagenta on fb! I follow lorena's blog on GFC. I follow "oh the lovely things!" 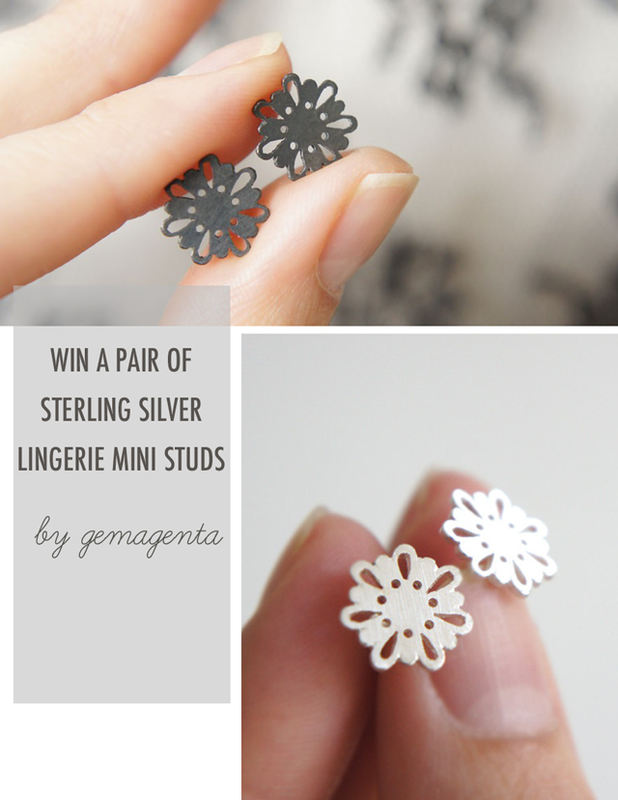 i love Lingerie Mini Studs - adorable! My favorite has to be the Lingerie Ring 005! I love that it almost looks like a little tiara! LOVE the mini gem studs! everything in this shop is so unique! love it! The Lingerie Tiny Cute Pendant is so cute! I love the studs you're giving away in the satin finish! I love the Pendeloque Earrings. love the geometry of the faceted pear pendant! The Lingerie Studs are my fav! Love the simplicity of the Wilhelmina necklace. I've been looking for something like it for a long time. Every piece is beautiful, but I've been eying Lingerie Ring 004 for awhile now! Although the shop has so many beautiful items, the minature mirror would have to be my favorite! I'm n love with Lingerie series! I twitted about the gieaway. I like the lingerie pendant necklace! I followed her blog too! I also followed your blog via bloglovin! my favorite is the Lingerie Tiny Cute Pendant! I love everything from her! and also I like Gemagenta Facebook page already!! What a gorgeous little shop! I enjoyed paging through all of the lovely items. I love gem brooch and the big sunset ring! I'm happily following her blog! I LOVE the Lingerie Sweetheart Necklace! I like the Faceted Heart Ring! I love the Gem Brooch! so sweet. Lorena is a great jeweller and I love her work!! the lingerie mini studs are fabulous! i like Gemagenta on Facebook! I follow the oh lovely things! I actually like the Lingerie Mini Studs the best out of everything! I'm following Oh the lovely things!!! What a difficult choice! I do love the Lingerie Ring 004 - though any of her lingerie pieces are so beautiful. I love the lingerie ring 0033. Oh, and following Oh the lovely things as well! Love your blog and thanks for the awesome giveaway! I follow Oh the Lovely Things. I liked Gemagenta on facebook. I love the Lingerie Tiny Cute Pendant - Sterling Silver - Hand Cut! I love the heart studs. So cute! I love the Long Earrings - QUETZAL Bird - AZTEC - Hand Cut! I liked Gemagenta on FB as Francesca Giveaway. the lingerie long earrings are my favorite! My favorite is the Sweetheart Neckline Pendant. I love the BIG sunset ring... love love love! I love the London print. I follow Gemagenta's blog on GFC. Lingerie Ring 002 is my absolute favorite. You're lucky to own one! "Like" Gemegenta on facebook as Sarah Blake. I am following Gemegenta using GFC with the google name sblake1989. Sunshine Ring - QUETZAL Bird Collection is my favorite piece! I really like the Lingerie Pendeloque Earrings - Sterling Silver - Hand Cut! My favourite item are the Lingerie Long Earrings! I already follow this blog via GFC! I love Lingerie Ring 003! i liked it on facebook as moi eugenia. I really like the Lingerie Pendeloque Earrings - they are dainty enough to be fancy, but big enough to be funky...depending on what you wear with them. I love jewelry that I can dress up or down. Plus, you can't beat anything so lovely that's handmade! I liked this contest on facebook! I tweeted about this contest! I appreciate the precision work of the carat series, but I adore the lingerie. I would comfortably wear the lingerie 006 ring, definitely!!! I really love the lingerie ring 003! I follow this lovely blog with bloglovin! thank you Lorena and this blog! I love the lingerie ring 002. It's so cute! I love the Lingerie Long Earrings! Thank you so much for offering such a beautiful and generous gift! My favorite are the "Mini Pin Earrings - QUETZAL Bird - Sterling & Copper - Hand Cut"
I "like" Gemagenta on Facebook - Cindy A.
I follow Gemagenta's blog via bloglovin'. I really love the Lingerie Pendeloque Earrings - Sterling Silver - Hand Cut. Lingerie Ring 005! Love the dark look! Love the Lingerie Elongated pendant!! Beautiful work!